The health world is usually focused on the heart, lungs and skin the most, but kidney health is equally as important. Your kidneys are essential to your overall health as they are responsible for removing waste from the body, balancing minerals, regulating water and producing hormones. Since your body needs a specific amount of water to function correctly, the kidneys assist your body in retaining water when your body doesn’t have enough and removing excess water when it has too much. Without your kidneys, your body is unable to filter out excess amounts of minerals. The kidneys are responsible for regulating the amount of sodium, calcium, phosphate and potassium levels in the body and expelling it via urine from the body. If your kidneys fail, other areas of your body will begin to diminish — such as bone health — because your kidneys produce an active form of Vitamin D that help your bones stay strong and healthy. Because kidneys are so vital to your body’s overall functions, it can be alarming to hear that more than 661,000 Americans have kidney failure, according to the National Institute of Diabetes and Digestive and Kidney Diseases. When someone is diagnosed with kidney disease, it means their kidneys are damaged and unable to filter blood the way they should. The kidney damage can cause toxic waste to build up in the body. Each year, kidney disease kills more people than breast or prostate cancer. With the number of startling statistics, it’s important to maintain proper kidney health. Flushing your kidneys is an important part of maintaining healthy kidneys. Not drinking enough water and consuming too much sugar can impede your body’s ability to function. Check out these four foods and juices that will flush your kidneys. Citrus juices aren’t just tasty beverages to enjoy with your breakfast. People consume citrus juices across the globe every day. Citrus juices are dynamic sources of vitamin C and provide your body with potassium, folate, magnesium and vitamin A. They are light, refreshing, full of vitamins and can help flush your kidneys. Doctors recommend a high fluid intake for the prevention of kidney stones. Drinking citrus juices can help ward off kidney stones because they contain citrate, which is known to prevent the development of calcium oxalate and calcium phosphate stones. Citrate is essential because it helps prevent kidney stone formation by decreasing the acidity of urine. Citrus juices are great for increasing urine volume by helping you to urinate more frequently due to the high levels of potassium and citric acid found in citrus juices. Doctors recommend people with very low urinary citrate to eat and drink more foods that are high in citric acid, such as lemon and lime juice. Studies show that drinking four ounces of lemon juice per day may substantially increase urine citrate levels without increasing oxalate levels. If lemon juice is too tart for your taste, try other juices that are also excellent sources of citrate like melon juice and orange juice. Your ultimate goal should be to consume as many healthy fluids as possible because increasing your overall fluid intake will help reduce the risk of stone formation in your kidneys. When you don’t drink enough fluids, urine output is decreased and urine flow is slower, which increases the possibility of stone formation. Drink up! Fish oil, the fat extracted from fish tissue, helps prevent many diseases. It’s rich in omega-3 fatty acids and contains vitamin A and D. Fish oil is extremely popular amongst health enthusiasts for its endless benefits. Studies show that consuming 1,200 milligrams a day of fish oil has been associated with significant decreases in urinary calcium and oxalate concentrations and increases in urinary citrate concentration. Consuming fish oil can reduce the amount of protein in your urine, especially for individuals who have already developed kidney disease. Taking fish oil can help slow the loss of kidney function in patients who have already developed kidney disease to avoid further damage. Be sure to eat cold-water fish, such as salmon, tuna, mackerel and sardines for the best kidney benefits. If fish isn’t something you enjoy, try eating walnuts, flax seeds or canola oil, which are also rich sources of dietary eicosapentaenoic acid (EPA). Getting enough calcium is very important for flushing your kidneys because low levels of calcium in your diet can cause oxalate levels to rise and cause kidney stones. There’s a misconception that not consuming calcium may help flush your kidneys. But, on the contrary, not getting enough calcium in the digestive tract to bind with oxalate will increase oxalate absorption and urinary oxalate excretion. It’s best to get your calcium from foods instead of calcium supplements as some studies show a link between taking calcium supplements and developing kidney stones. Low-fat milk, low-fat cheese and low-fat yogurt are great calcium-rich options that can help flush your kidneys. If you happen to be lactose intolerant, try eating calcium-fortified foods such as orange juice, soy milk, tofu, calcium-fortified cereals, sardines with bones and almonds to get your daily dose of calcium. Vegetarian diets are great for preventing kidney function decline and treating kidney failure. Diets that are high in animal protein are associated with increased serum and urine uric acid in healthy people, which creates excess strain on the kidneys. A vegetarian diet can help the body better handle phosphorus excretion from plant-based diets by reducing the risk of metastatic calcification in your kidneys. Kidney health is essential for your body to function properly. Kidneys play a prime role in everyday functions of the body, such as removing waste, regulating water levels and the development of hormones. If you’ve ever experienced any kidney-related health issues, then you know first hand the importance of flushing and maintaining healthy kidneys. What foods and juices have you used to flush your kidneys? Leave your comments below! Next articleStudents Spark ‘Never Again Movement’ After Florida Shooting — Have We Reached A Tipping Point? 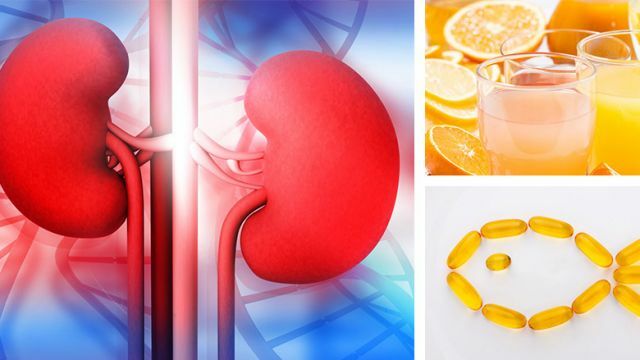 Hey Buddy!, I found this information for you: "4 Ingredients That Will Flush Your Kidneys". Here is the website link: https://www.thealternativedaily.com/4-ingredients-to-flush-your-kidneys/. Thank you.